These seeds of the almond fruit, otherwise known as a drupe, are known as a superfood and full of antioxidants. We call them nuts, but the fact is, this superfood is full of healthy fiber, fat, and protein. But, we are not here to discuss the almonds that we eat. Today, we are going to take a look at the oils derived from this food and what it does for use. The benefits of sweet almond oil, which include benefits for skin, hair, and face, are listed below. Before we start with that I want to distinguish the difference between two different almond oils. Did you realize there were different types of almond trees? I wasn’t until I started researching this article, and as it turns out, there is a huge difference between the two. They come from a completely different tree altogether. This oil comes from the Prunus dulcis, var. amygdalus, or the sweet almond tree, and bitter almond oil comes from the Prunus dulcis, var. amara or bitter almond tree. The tree we get the “nuts” we love so much is the sweet one, while the bitter produces a seed that is short and broad in comparison to the almonds we know. When it comes to cooking, the sweet kind is the go-to, just as it’s the one that holds all the health benefits. Bitter almond, which many people love due to its aroma, doesn’t have much more to offer in terms of benefits. Also, consuming bitter almond is discouraged since it contains a toxic compound known as hydrocyanic acid. Another distinct difference is that the sweet tree grows white flowers while the bitter has pink. So, what are the benefits of sweet almond oil? We are going to cover them one by one, and by the time we’re done, you are going to wonder why it took you so long to get some of this oil. There were commercials in my day as a child that made having dandruff seem to be a thing to be ashamed of. The reality is, dandruff can be a serious problem if not treated and can cause problems for a person who has it. Ways you can battle dandruff is by relieving your daily stress, washing your hair regularly, getting some sun, and mixing some tea tree essential oil with this oil for a natural mask. It also works on this problem by moisturizing the scalp and eliminating any dead cells that are hanging around. With the addition of tea tree essential oil, this mixture can become quite dynamic in the battle against dandruff. Just put a few drops of the tea tree into an ounce of sweet almond and massage it into your scalp. Start small with the tea tree and grow from there but don’t put in too much. Tea tree is very powerful and can cause headaches so read up on it before applying it anywhere on your body. If the addition of tea tree oil sounds like more than you bargained for, that’s fine. Just put some into your hand and rub it into your scalp. While tea tree is helpful with dandruff, sweet almond has properties to help all on its own. I used to be a nail biter but was able to kick the habit. Yet, the years of abuse I put on my nails hindered their strength. There are so many reasons why we might have weak nails. Biting is one, peeling is another. They could be weak from a lack of vitamins, or you could be genetically predisposed to have nails that break easily. Whatever the reason is, weak nails are not fun for a ton of reasons as well. It can peel back too far and expose the nail bed, which can hurt. Peeling and breaking nails are horrible when it comes to manicures, and a snagged nail can ruin your clothing like sweaters and tights. Let’s make no mistake, weak nails are no bueno. This oil helps with this issue because it can keep the nails protected from the fungus that might cause an infection. It can also promote growth, which creates a stronger nail. You should see a reduction in nail breakage if you apply it once a day to your nail beds. No one wants to look old. Our society values youth, and once that begins to disappear, many of use, this writer included, do what we can to move the clock backward. Why? Because we want to be younger. More so, people want to look younger. The multibillion-dollar cosmetic industry is based on that fact. Without that desire, they would go under. There is nothing wrong with wanting to look younger, but we highly recommend using natural resources before resorting to chemicals and/or surgical remedies. 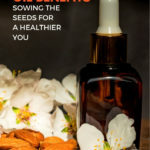 Sweet almond oil works as an antioxidant that is close to the strength of vitamin E. That, plus the fatty acids, and other effective ingredients inside attack free radicals and create a neutral environment on your skin. Without that neutralization, your skin can start to produce wrinkles and age spots. You can create a moisturizer with sweet almond oil and lavender intended for application after you wash your face. Rub it in, let it sit for a bit, and then rinse well. If you want to sleep with it on, that’s fine but you may clog your pores so wash your face well in the morning. I have them and hated them. When I am going out, I put makeup in the shape of a V under my eye and pat it gently with a triangle sponge. This ritual is done with hopes of hiding the dark circles all my years of hard work and worries have given me. Dark circles are common, and we know that they make us look tired. Makeup might cover them but getting rid of them or at least reducing their appearance would be all the better. There are some ways in which we can do this. Cucumber slices are said to help if left on the eyes. So are metal spoons that have sat in the freezer for an hour or so. When it comes to the oil we’ve been discussing, all you need to do is pat a bit gently under your eyes before you go to bed and let the compounds work while you slumber. It is important that you don’t get any of the oil in your eyes. One of the many uses for sweet almond oil is to get rid of those pesky scars that have accumulated if you had acne or if you scraped your leg badly. While the cut or open wound has healed, you are left with a darkened mark which is a constant reminder of the injury and a bit of an eyesore. Scars come in all shapes, sizes, colors, and textures. There are several natural remedies available to diminish these marks including lemon, honey, apple cider vinegar, and (you guessed it!) sweet almond oil. Just rub a little bit on the mark and let the oil do its work. You can create a scar fighting mixture with the above items and a bit of frankincense oil, which is also known for its scar reducing powers. Baking soda is another natural scar fighter. Even though we are warned time and time again how dangerous the sun can be sometimes, we can forget and get caught up in some outdoor fun. Beaches, pools, picnics, and just sitting in our yards can lead to red skin that burns when the air blows. Of course, if you have a severe sunburn, you should seek out medical attention immediately. But, if you are easily burned and have dealt with it before or if you have gone through it before, we wonder if you have ever tried sweet almond oil as a remedy. While aloe vera is the go-to for this type of issue, don’t count out this oil. You could blend it with some Roman chamomile and lavender and apply it gently to the irritated areas. While you may be thinking, “Aloe vera works just fine for me,” I can tell you that sweet almond won’t be as sticky, and with the addition of essential oils, the blend will smell much better. Lips become chapped. This we know, but are you aware of the reasons why your lips might get dry and cracked? Sometimes it’s because of the cold weather, the lack of hydration, or you lick your lips a little too much. Whatever the reason might be, chapped lips are a pain figuratively and literally. Drinking plenty of water should help you with chapped lips and so does using a humidifier in your home and/or office. Another way people treat this is by drinking carrot juice. For the purpose of this article, we can talk about the healing and repairing benefits of sweet almond oil. Just put a little on your clean finger and apply this oil directly to your lips. It shouldn’t be long before the chapness is reduced or completely disappears. This oil is able to help because the lips can absorb it well since it is loaded with fatty acids, and also it works well as a natural moisturizer. There are all types of disorders that cause inflammation of the skin. There is eczema, psoriasis, and rosacea, all of which are serious and more than annoying. While each of these skin issues is unique, they all have certain things in common, which is irritated, red, itchy, dry skin. Each of these diseases requires medical attention. There are pharmaceutical ways you can treat these inflammations, but there are also natural ways you can battle your discomfort and sweet almond oil is one of them. Just apply some with some care and see if it eases any of your symptoms. If you find that your suffering from internal inflammation, then ingesting some sweet almond oil can help with those types of digestive issues. This is because of its anti-inflammatory properties. Of course, you should always consult a healthcare professional before ingesting anything unfamiliar, but sweet almond oil is relatively on the safe side. But, if you plan on mixing any essential oils in with this carrier substance, then we suggest checking first. When you opt to use this oil for your culinary ventures, you might find that your cardiovascular health has been given a bit of a life renewal. This oil has the ability to lower bad cholesterol levels while adding good cholesterol to your system. It’s able to do this because it is chock full of monounsaturated fatty acids. With its anti-inflammatory and antioxidant properties, this oil can also diminish your chances of developing a cardiovascular disease. If you plan on adding this oil to your diet, I would suggest using it in a salad dressing or any dish where you will eat it raw. If you want to cook with it, that is fine, just be sure to keep it at a low flame so you don’t damage the beneficial properties of the oil. You might find that you enjoy the taste and will throw away the butter and lard for good. One of the many reasons why almonds have made it on the list of superfoods is because of their ability to kick start the brain. Not only do almonds get the brain moving, but it also seems to improve memory as well as retention. That’s why it makes sense that the oil extracted from this very seed has this wonderful brain-boosting power as well. You can add some scented oils and rub it on your temples or just saute some salmon in it to create a dinner of brain power food that would be difficult to match. Or, you can put a little in your morning water or tea. The idea is to get it into your system so that it can reach your brain. From there, you may find that you can recall situations, lessons, and meetings better as well as problem solve at a quicker rate. Both your hair and nails are made up of something call keratin. This is a substance that consists of dead cells, primarily from the skin, so it should be no surprise that almond oil is just as beneficial for the hair as it is for the nails. Not only does it moisturize, but there is a ton of vitamin E inside, which can rejuvenate the follicles leaving your hair to look fuller and more luxurious. You can mix some of your lavender oil, which is also good for hair, with the sweet almond and run it through your hair. Rub it into your scalp and let sit for a little while. Then wash your hair and moisturize as usual. I also like to add a drop blend of lavender, rose absolute, ylang-ylang, and sweet almond oil to my palms and then run it through my clean hair before it is dried. It can bring more health to my hair care regimen and ensure that I smell good throughout the day. Sweet almond oil isn’t very hard to obtain unlike its counterpart the bitter almond oil. Which is good because the sweet version holds all the benefits. If you have used sweet almond for something other than the reasons we spoke about today, leave us a comment in the section below. If you know someone that would benefit from reading this article, please share it with them.